One of the most noticeable improvements has been his responsiveness to quartering and “come-when-called” whistle commands. On most single whistles, he changed direction quickly, and on drawn-out whistles he returned to our side. 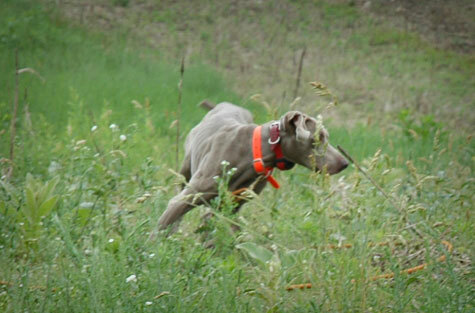 Stuka’s progress in steadiness on point and wing was impressive. An important aspect of this training has been the use of single and multiple birds via remote launchers. Varying the volume of birds released helps strengthen his steadiness in real-world conditions where he may likely encounter multi-bird flushes. It was satisfying to see this development, which was in part due to the whoa-work we’ve been doing in the backyard. He is now fully acclimated to gunfire. 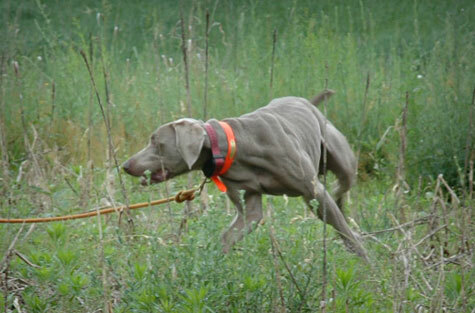 As a result, the next week will include birds being shot overhead in order to start connecting the concept of steadiness to the reward of retrieving downed birds. Speaking of retrieving, his skills in this area have been very good. This does not come as a surprise, since he has typically enjoyed the process of retrieving bumpers. When he was a puppy his bird interest was moderate; he wasn’t quite sure to make of all the fuss about birds. But the consistent bird exposure over the past two weeks has sparked a keen interest in seeking them out, and it was exciting to see him working scent.